These yeast rolls from the Hopewell Heritage Cookbook are loved by children and adults alike. Pour warm water into large mixing bowl. Add yeast and sugar, and let sit for about 5 minutes. Add oil, egg, and salt, and stir well. Slowly stir in flour, and store in refrigerator until ready to roll out, at least 3 hours or up to a few days. Roll out on a well-floured breadboard, working extra flour into sticky dough until it does not stick when you roll it out. Cut with biscuit cutter, dipping cutter in flour often. Place on greased cookie sheet, and let rise in warm place for about 1 hour, or until doubled in size. Bake at 350° until brown. Yield: approximately 24 rolls, depending on size. 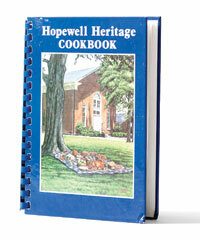 To order a copy of Hopewell Heritage Cookbook, call the church office at (704) 875-2291. Cookbooks are $14.95, plus shipping.